Easy pattern assembly instructions included. 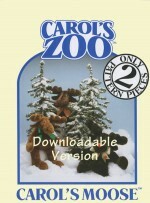 Carols Zoo Patterns are protected by copyright and are exclusively for the individual purchaser. They cannot be copied, shared, scanned or traded in any form with a third party. PLEASE DOWNLOAD THE PATTERN IMMEDIATELY USING THE CODE YOU RECEIVE AFTER CHECKOUT. All links expire 5 days after the date of your order.